Hi I'm a male model, 26 years old and have been modelling since the start of march 2014. I have done a variety of shoots so far and would like to do more alt fashion, though I'm more than happy t give anything a try . I'm big, broad build. Have many tattoos including neck, sleeve, knuckles, back and legs. 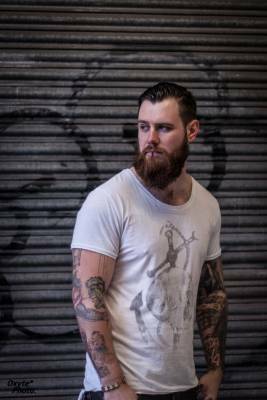 I have medium hair that can be put in a variety of styles and a large well kept beard. I'm happy to travel and own a car though depending on distance and assignment I will require some kind of costs for fuel. I'm happy to work for trade but do want this to be my career eventually so will want to take paid work as well. I'm on pp pete1909 feel free to check out my references on there.